Each box has the oblong form of the old gold money unit koban　小判, with three boxes stapled to carry away, held by an auspicious straw rope. 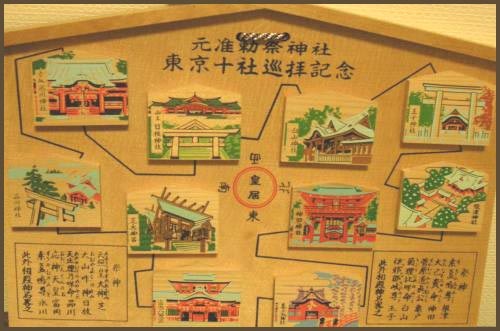 It is made from the same wood as the roof decoration of the shrine (shingi). 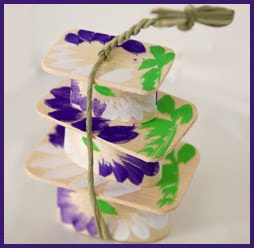 It is painted colorful in special colors of white, green and purple with wisteria blossoms. Each box contains roasted beans, so it sounds "karakara korokoro" when shaken. The beans were later replaced by sugar-coated beans and other kinds of sweets. The ladies of Edo had a pun on the sound of CHIGI 千着, one thousand kimonos, and bought this amulet to improve the number of their robes. 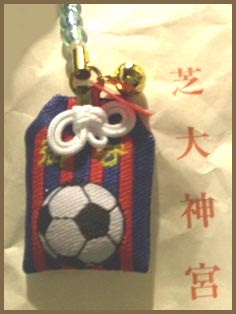 Now it is also sold as an amulet to bring a good relationship. The ladies used to hang this amulet from the beams of the kitchen. When a strong thunder rattled the home, they would eat some beans to appease the God of Thunder, who's sound is also heared as "korokoro". 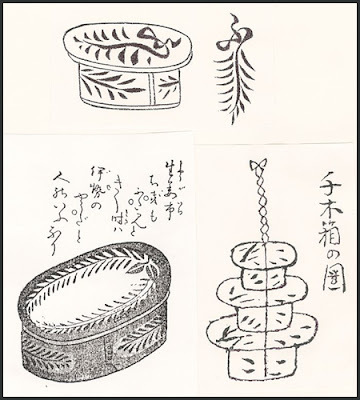 During the Autumn Festival in September, the three special boxes of the shrine offering are also filled with other seasonal food items, such as sweet chestnuts (kuri), matsutake mushrooms and abalone (awabi), as an expression of gratitude to the female deity for a bountiful harvest. The goddess of agriculture and industry in the Shinto religion. Worshipped at the Gegu 下宮 in Ise. The Shiba shrine is probably the only one where she was worshipped in Edo, since she is closer related to farmers and a good harvest.
. Hibiya 日比谷 / 日比谷神明 Hibiya Shinmei / 芝神明社 Shiba Shinmei-Sha.
. Ise Grand Shrine (伊勢神宮, Ise Jingū) .
. Paintings of Toys sold at the Shiba Shrine 玩具絵 . The offspring of Wakumusuhi, whom Izanami bore as she lay dying after giving birth to the fire kami, Kagutsuchi. The Kojiki account describes Toyoukehime as one of the kami assigned by Amaterasu to accompany Ninigi upon his descent, together with the mirror (kagami) that served as Amaterasu's spirit-vessel (mitamashiro). 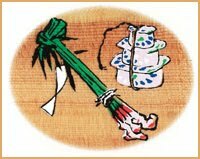 Based on her role as tutelary of food, Toyoukehime is identified with various other deities, including Ukemochi, Ōgetsuhime, Ukanomitama, and Toyoukanome. 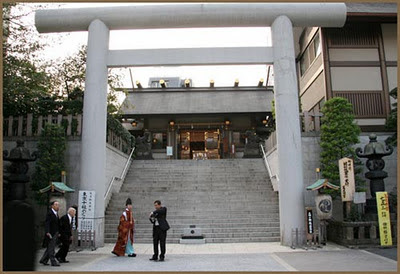 As the kami of foodstuffs who presents food offerings to Amaterasu no ōmikami, Toyoukehime is enshrined at the Outer Shrine (Gekū or Wataraigū) of the Grand Shrines of Ise. Legend states that in response to an oracle, Toyoukehime moved to Ise from her original location at Manai in Hiji of Tanba Province, a legend possibly related to the fact that a deity called Toyoukanome was enshrined in the Nagu Shrine there. 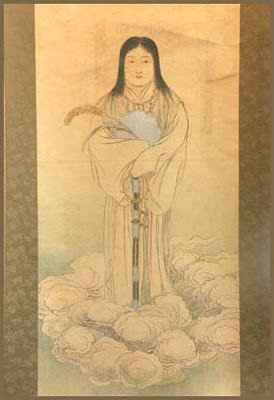 Under the influence of medieval Ryōbu Shinto, Toyoukehime was identified in numerous ways as a counterpart to Amaterasu, including descriptions as moon deity, water deity, Dainichi of the Diamond Realm and Shikidaibon Tennō. Toyoukehime is the chief object of worship (saijin) at the "Outer Shrine" (Toyouke Daijingū　in Ise. Among the kami that Inari has been associated with are Miketsu Okami, Ogetsu Hime no Kami, Ukanomitama no Kami, Toyouke Hime no Kami, and Toyouke no Kami. Founded in 1005, by the Emperor Ichijoo Tennoo 一条天皇. This shrine is popular for wedding ceremonies. as it is also called, is one of the ten most important shrines of Tokyo chosen by Emperor Meiji to be the guardian shrines of the city. It is also one of the most ancient shrines in Tokyo and is said to be dedicated to a branch deity of the Ise Shrine of the mid-Heian period. A popular event at the shrine is the Dara-dara Matsuri だらだら祭り, or the Ginger Root Festival , held every September since the Edo period. Literally meaning "prolonged festival" Dara-dara Matsuri lasts for 11 days - from September 11 to 21. Also called Shoga Matsuri , or the Ginger Root Festival, ginger root is offered at the altar of the shrine during the festival. Other features of the Festival include open-air stalls selling ginger root besides other traditional knick-knacks and food items. A parade of mikoshi (portable shrines) is taken out with over 400 participants dressed in ancient court costume carrying them.
. ubusunagami 産土神 deity of the birthplace . Another amulet from this shrine is for good business. It brings a thousand visitors to the store 千客万来. 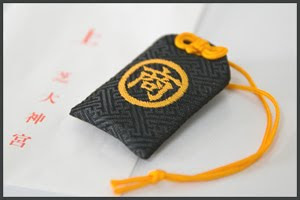 On the beautiful silken black bag the Chinese character for Business　商 is emproidered. kuroji 黒生地 black material, is a pun with "black figures" 黒字　in the balance book. chigi 千木 "1000 roof beams"
Two characteristic features of shrine architecture, katsuogi 鰹木 refer to log-like sections laid horizontally along and perpendicular to, the ridge line of the structure, while chigi refer to poles that appear to extend from the roof's gableboards, intersecting at the ridge and continuing upwards for some distance. In ancient times, katsuogi were used as symbols of status or rank on the houses of members of the court and other powerful families, but they later came to be used only on the major structures of shrines. They are usually found in combination with chigi. The latter are believed to be a vestige of primitive construction practices in which roofs were formed by crossing and binding together ridge-support poles, the extended tops of which were left uncut. 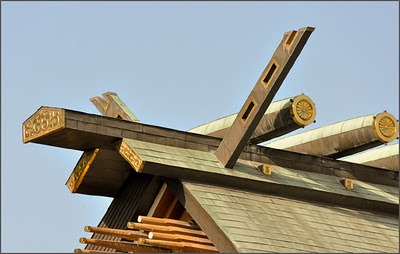 In time, independent crossed boards were mounted on the roof as decorative elements rather than as integral to the crossed and extended gableboards; these were called okichigi ("set chigi"). Normally, the ends of the diagonal chigi are cut at mitered angles either perpendicular (sotosogi) or parallel (uchisogi) to the ground, leading to the alternate name katasogi ("miters"). In any event, the original purpose of chigi was as a functional reinforcement to the structure, but today, most serve as symbols emphasizing the sacred nature of the structure. shrines to female kami have an even number of katsuogi, and chigi are cut parallel to the ground. Many other shrines have subsequently copied this design practice. Celebrated on Nanuka Shoogatsu 七日正月, seventh day of the first lunar month, to lead over into the New Year. Many people visit the shrine on this day.